The Cutera Laser can effectively diminish spider veins and significantly reduce hair growth with a series of treatments to achieve smoother skin. This type of hair removal works best on dark or coarse hair. A noticeable amount of hair reduction can be seen with each service. Please contact us to schedule a consultation prior to any scheduled service. Consult fee $60 - Half of the consult fee will be applied to your first laser session. Half off any area after the 8th session for spot treatment only. Ask about our special prices available for pre-paid packages of 3 or 6 treatments. 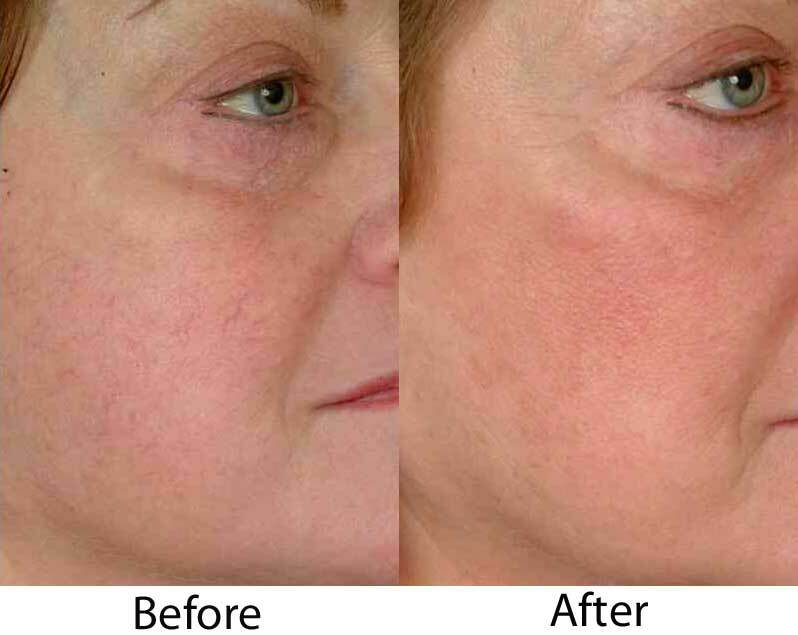 Laser Genesis uses a non-invasive laser technology to treat fine line wrinkles, large pores, uneven skin texture, redness, and reduce scarring. 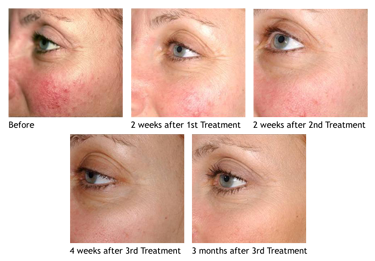 The laser treatment is also used the diffuse the redness caused by the dilated capillaries of rosacea. 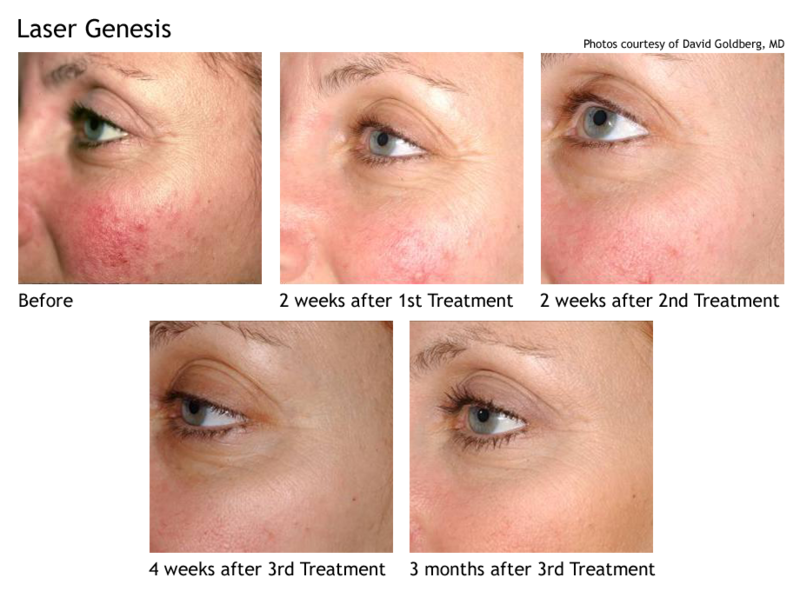 Effective laser treatment for redness caused by Rosacea. The technology used by Laser Genesis results in a gentle warming of the skin during the procedure as the laser tool is moved across the surface of the skin. The treatment works by stimulating collagen regrowth in the upper dermis of the skin. Laser Genesis: $225 for one treatment, $561 for three treatments, and $1,122 for six treatments. $325 for face and neck. Utilizing CoolGlide® technology, our estheticians can fade unsightly spider veins, blue leg veins, blood blisters and port wine stains, resulting in a more even skin tone. CoolGlide® is preferred by doctors in part because it doesn't include painful injections. The Cutera Cool Guide system delivers pulses of light energy, causing the blood within the vein to coagulate. Eventually this destroys the vein, which is later reabsorbed by your body and subsequent blood flow becomes redirected to deeper veins. The technology works to effectively treat both tiny superficial face veins and deeper blue leg veins on men and women of all skin tones. One to two treatments is usually sufficient, but this depends on the number, color, and size of the various blood vessels being treated. Most patients seen results within 2-6 weeks of their treatment. Note: knotty blue leg veins and not good candidates for this treatment. The MLS Robotic Laser therapy helps: Manage Pain, Reduce Inflammation and speed recovery. 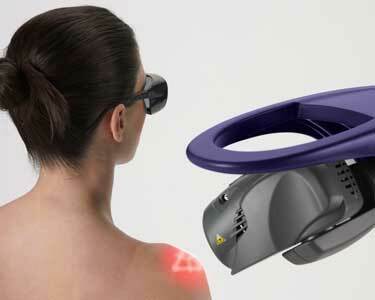 Laser Therapy is the use of specific wavelengths of light to treat painful and debilitating conditions. Laser Treatment works with light energy entering the damaged cells and stimulating inter-cellular activity. This reduces pain in the area and speeds recovery of the damaged cells. Once the cells recover, the healing process is complete. Treatment is painless and lasts an average of 15 minutes. You may experience a comfortable sensation at the point of application. The laser does not generate heat and is safe to use over implanted metal devices. MLS is the only Class 4 laser which is safe to use over surgical hardware. Many people experience positive results within a few treatments, depending on if the condition is acute or chronic. Most acute conditions will need 4 to 6 treatments, and most chronic conditions will require 10 to 15 treatments. Acute conditions usually subside quickly, typically with one phase of treatment, while chronic conditions can be controlled with regular treatment, if complete relief is not attained. The effects of MLS Robotic Laser Therapy are cumulative; therefore, expect to see improvement as you proceed through your treatment plan. During the course of your treatment plan the doctor will monitor your results to make the necessary updates to your plan to achieve the maximum results. Sole Therapy Medical Day Spa operates under the medical direction of Cascade Foot & Ankle. Cascade Foot & Ankle is the first pain practice in Yakima to use the MLS Robotic Laser. Our laser treatments are conducted in our practice's surgical unit, which is connected to Sole Therapy. Our doctors and technicians are certified in Advanced MLS Laser Therapy. This means we apply customized treatment protocols that are unique to our practice and each patient. We have applied thousands of laser treatments for a wide variety of conditions. Our practice is affiliated with the Laser Pain Management Association. MLS Robotic Laser Therapy has been cleared by the FDA and proven successful as evidenced by extensive and credible studies conducted in our country's finest institutions, including Harvard University. Call (509) 225-3668 for your consultation to see if you are a candidate for MLS Laser Therapy.